UK scientists and environmental academics have been giving their reactions to the Intergovernmental Panel on Climate Change (IPCC) report. The international body of scientists warned that global climate change was "very likely" to have a human cause. The IPCC has projected a probable increase in temperatures of 1.8-4C (3.2-7.2F) by the end of the century, while sea levels were most likely to rise by 28-43cm. This report makes it clear, more convincingly than ever before, that human actions are writ large on the changes we are seeing, and will see, to our climate. The IPCC strongly emphasises that substantial climate change is inevitable, and we will have to adapt to this. This should compel all of us - world leaders, businesses and individuals - towards action rather than the paralysis of fear. We need both to reduce our emissions of greenhouse gases and to prepare for the impacts of climate change. Those who would claim otherwise can no longer use science as a basis for their argument. This report confirms what scientists have suspected for more than a decade - humans are now driving the changes we are seeing in the world's climate and that over the coming decades we will introduce new climate-related risks to many parts of the world. For the UK, the existing recommended guidelines for climate change planning remain consistent with this new IPCC report: a likely annual warming of between 2C and 3.5C (3.6-6.3F) by the 2080s; a rise is sea-level of between 10 and 70cm; more heatwaves; more heavy winter rain; and less wintry weather. It remains very unlikely that the Gulf Stream will be radically altered this century. This is the clearest view of the future that humankind has ever had. It is necessarily conservative, is based on sound science, and has been careful to avoid wild speculation. 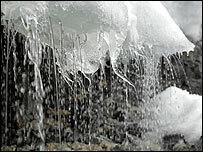 There are still major uncertainties surrounding such things as the melting of ice caps. Nevertheless, the predictions for sea level rise in the report, and the melting already in train because of emissions of greenhouse gases that have already taken place, guarantee a future where social and economic issues of food production, water availability and climate driven migration are things we have to begin to manage now. The sheer number and complexity of predictive climate models developed since the last assessment report is enough to make one's head spin. For those hoping for good news, this report will make painful reading. Avoiding 2C (3.6F) of post-industrial warming looks harder than ever. With caveats and uncertainties, scenarios and forcings, the report could make a dry old read, but between its conservatively worded lines hangs the very future of human civilization. There is now virtually no doubt that climate change is directly linked to mankind's profligate consumption of energy. This issue cannot possibly be addressed by technology alone but requires lifestyle change. There is now little doubt that both flooding and drought will increase faster than previously thought. This means that our island's coastal defences will have to be significantly strengthened and that the water supply crisis in south-east England will become very much worse. It is now a matter of extreme urgency that we cut back on burning fossil fuels. Decisions have to be made immediately to extend nuclear new build as well as renewables. The message from IPCC is stark. Indeed, we are almost certainly past the "tipping point" and will be hard put to it to hold carbon dioxide emissions to the top limit of 550 parts per million (ppm) unless low carbon technologies are introduced as a matter of extreme urgency.